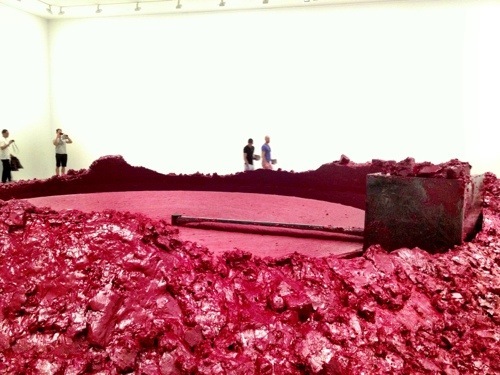 With the photos of Anish Kapoor’s work lingering in my iPhone for quite a while now and with the exhibition drawing to a close in a couple of weeks (April 1 2013), I thought I had better do a review and maybe go see the exhibition again this weekend. 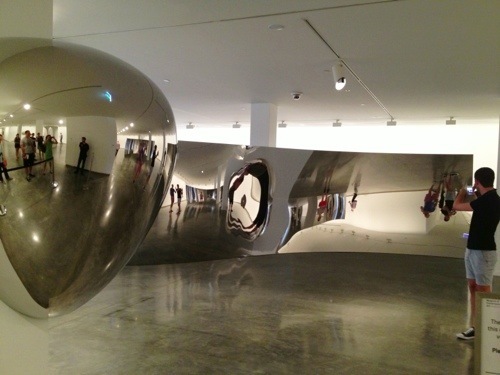 ‘Anish Kapoor Exhibition’ at the Museum of Contemporary Art in Sydney is the first major exhibition In Australia by celebrated contemporary artist Anish Kapoor. 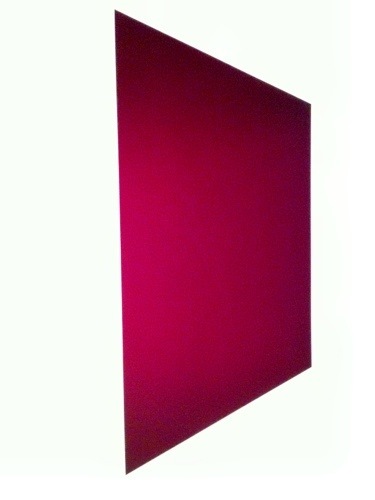 His works are in many ways an ode to purity and perception, enacted in three-dimensional space through the use of colour and material. 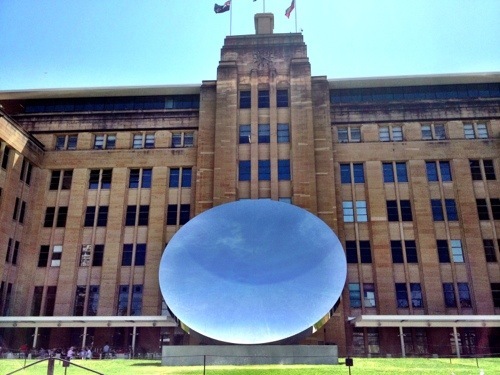 Installed on the strip of lawn in front of the MCA is the Sky Mirror (2006) – a polished giant dish drawing attention to itself at the same time attracting us to view the sky and our surrounding through its reflection. 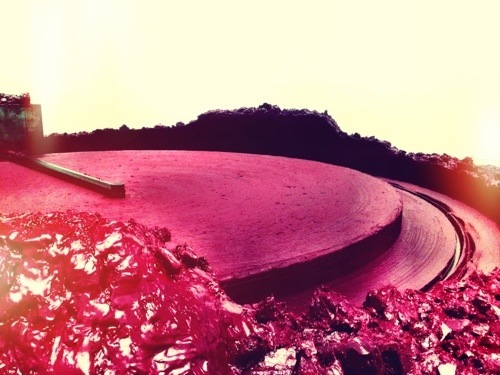 Herein lies the sculptor’s idea of a connection between the astronomical observation and the reality of our cityscape. Unfortunately, due to the limitation of real estate, the strip of lawn does not do justice to allow the piece to take the best advantage of the sky. The installation is indeed enormous but somehow seem lost due to its ‘tight’ location and the fact that there is already a lot going on in the pedestrian level for the viewers to stop, contemplate and absorb the energy of the giant strobe to the ethereal. Below is a a better example where the spaciousness of space really shows off its majesty by giving the spectator a sense of scale and space. 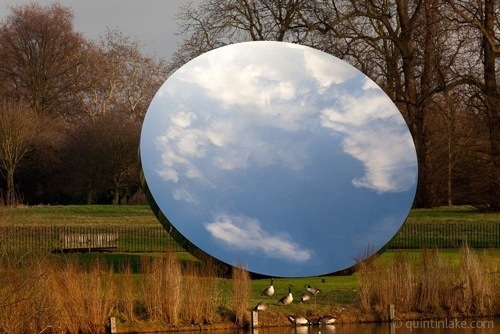 Sky Mirror (2006), Installation view, Kensington Gardens, London, 2010-11, stainless steel. 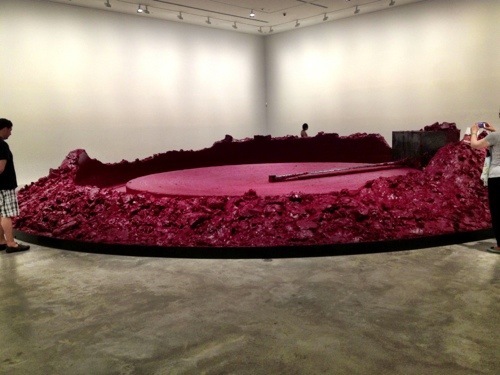 In a private room inside the MCA is My Red Homeland (2003) – a red 25m in diameter sculpture. Red alluding to his Indian background. 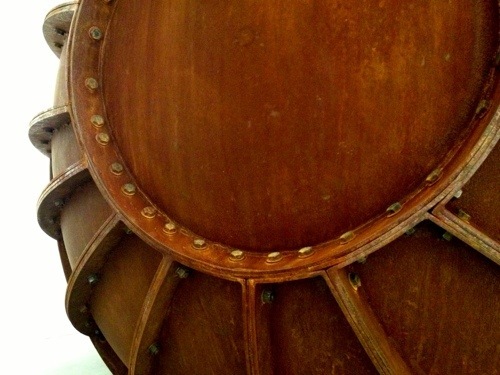 This is like watching a piece of art making art – akin to the needle of a vinyl record player sweeping very slowly around the piece, gradually remoulding the malleable form in the process. Here, the artist is alluding to metaphysics of life (and the caste systme, as well?) 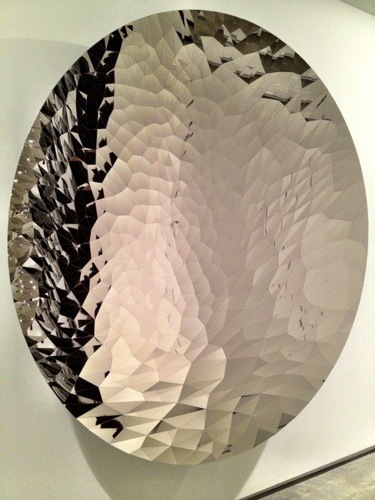 where ‘The constant circular movement reflects the human body clock, bookended, as it is, by birth and death’. 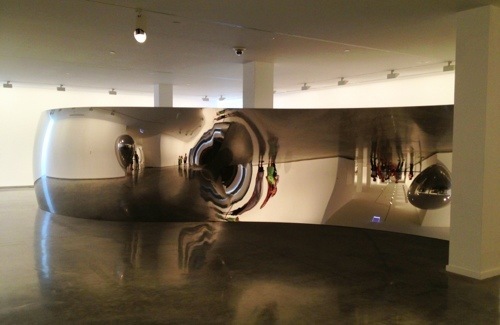 Kapoor’s curious mirrors, reflective surfaces, fibreglass voids and surreal wall installations explored different materials’ capacities for visual illusion and further pulled in the audience by confusing their perception of what is void and what is filled – the idea that the visceral world of world is not what it seemed. 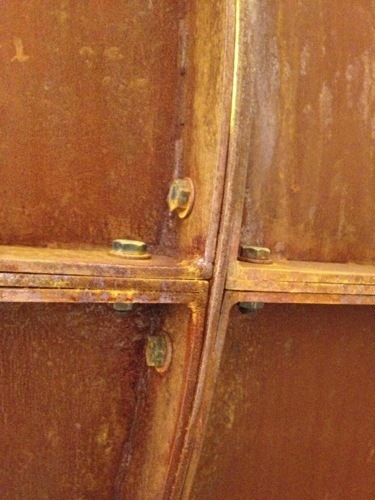 Hey, there’s a hole in the wall! 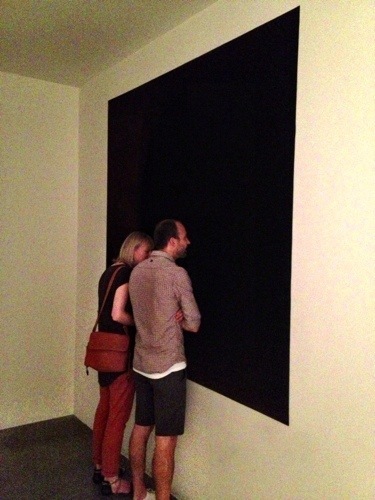 Is this a wall or a void? 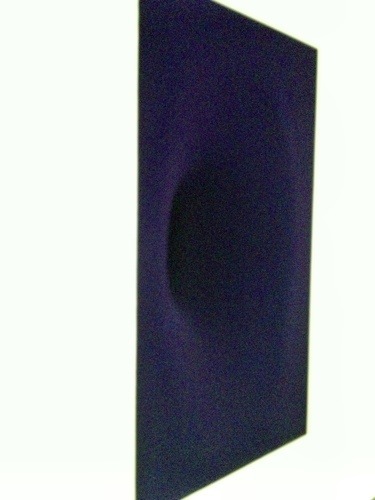 Kapoor’s earlier works in geometric dry pigments echoes the long history in Hindu rituals. 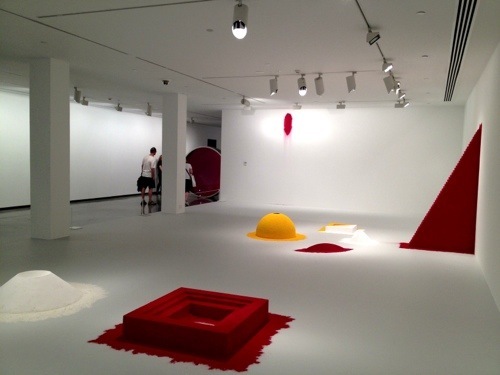 He is exploring the idea of the divine that from nothingness (powder), shapes (mass) can be created. 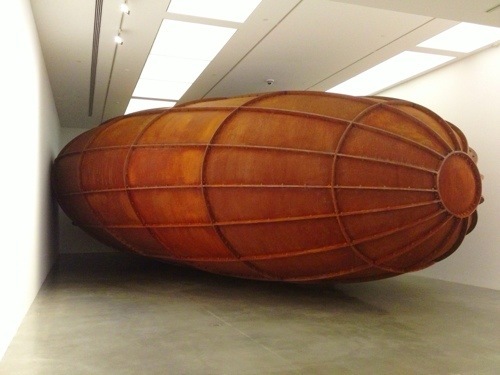 All-in-all, although deep in examining the metaphysics with powerful conceptual works, Anish Kapoor’s works evokes fun by pushing the boundaries where even the kids will enjoy! 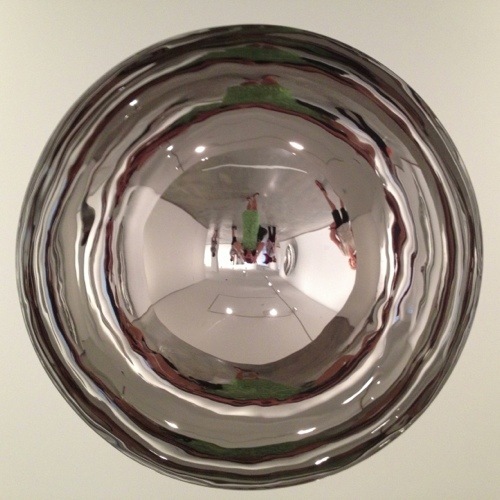 This entry was posted in Museum, Museum review, Sydney and tagged Anish Kapoor, Contemporary art, India, MCA, Sky Mirror, Sydney. Bookmark the permalink.